I use the term "100% crop" to mean a portion of a picture that has been cropped but not resized, but I have also seen some confusion around that term. Is there an accepted definition for "100% crop?" What is its opposite called? If I'm right, what is the proper name for "something else?" If I'm wrong, please include illustrations. Either way, what evidence supports the definitions? It simply means you have cropped a portion of the image but not resized it. This is usually done to demonstrate noise or lens sharpness, where you do not want resizing to affect the image. So you want to show the original pixels, but rather than sharing 4000 x 3000 pixels, you crop out a portion at the same resolution. So you are correct in your assumption. "100%" refers to the resolution being equal to the original. I'd ignore the fact that it's cropped, that's just for convenience. So the opposite of 100% resolution is an image that is scaled/resized (up or down). Edit: jrista's answer that 100% crop can refer to a full image is probably right. I can see that. I would call a full image "uncropped" though myself. 100% crop = 1 to 1 pixel mapping on your screen. I.e. one pixel from the image maps to one pixel on the screen. Edit: And just to add - by the nature of doing that, you must crop the image, because no regular screen can display the full resolution image from a modern camera (yet?). The term as generally used can confusing if you read too much into it. One might take the literal meaning as "100% not there", which of course makes no sense, or alternatively, "not really any crop at all; it's 100% of the picture". But generally what people mean is "100% view, cropped". 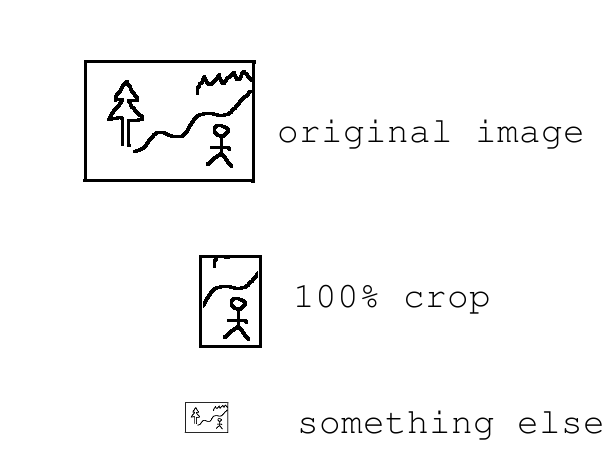 a 1:1 pixel representation, which many image editors and viewers call "100% zoom". Not rescaled. Each pixel in the image is represented by one pixel on your viewing device. a detail cropped from the full image rather than the whole big thing. This is either simply to make the image fit on people's monitors without scaling, but also to focus critical attention on that detail (usually to examine some technical flaw or artifact hard to see at a normal viewing scale). Because it's confusing, I recommend against using this term, and instead say "pixel-level detail" or "crop of a 1:1 view". I'm not going to tilt against windmills and try to ban the very common usage; I just try to avoid it as it clearly introduces confusion for some people not accustomed to the jargon. And it also leads some people to think that details at this level should look technically perfect, when really it's the final viewing size that matters, and looking at the pixel level is only a technical tool. To my surprise, Google Books doesn't find this phrase in print at all — even though a web search shows millions of uses. Now, granted, some large fraction of those hits seem to be "what does 100% crop mean", but the answers are pretty universally in agreement with the definition I've given above. As monitors become more high-resolution, to the point where individual pixels are not discernible by the human eye (the "retina display" idea), the value of this becomes less; probably in the future we'll hear more about "200% crop" or "400% crop", because generally the point is to examine the image at pixel level. Your smaller "something else" image is simply going the other way: something like 25% zoomed (but not, in this case, cropped). Each pixel in the original image is a quarter-size in each direction, so each pixel on the monitor represents sixteen, blended together. In addition to reducing detail, this masks many pixel-level artifacts (like noise), hides blur, and so on. That's not necessarily bad, because it's more representative of a print (especially at normal viewing distance) or of how an image is used for online display. But if those technical details are your concern — as with many online troubleshooting posts where a "100% crop" is requested — it won't do. When referring to a final image, I've always understood 100% crop to mean the entire image without cropping, but possibly resizing. When referring to previewing an image to determine image quality, I've always understood 100% crop to mean viewing the image at 100% zoom so you see maximum detail. The term has usually had a contextual dependency in conversations I've had, so there isn't a single meaning as far as I am concerned. Not the answer you're looking for? Browse other questions tagged terminology cropping or ask your own question. If it's not a 100% crop, what is it? Is it better to crop in Raw than JPEG? Can I crop to an exact size in Darktable?